I’m with Selgin on this one. Macroeconomic policy should be consistent with what basic microeconomics tells us about the price mechanism. Stable prices are mischievous things in an unstable world. Meeting the demand to hold money is what matters. This is a possibly good argument for a deflationary target: deflation makes the consequences of bad labour market and minimum pricing policies apparent, so it should encourage policymakers to reform in these areas. William, fundamentally I agree. George is right, but I must also say that there empirically might not be a major difference between a 0% and 5% NGDP target for a country like the US. I don’t think it makes a large difference if you argue for 0% NGDPLT or a 5% NGDPLT. Sumner defends the higher targets with ‘the money illusion’ agreement, but I think that’s a little tricky, he might be right that its easier to hold wages constant compared to lowering them, that in turn might lead to a faster recovery if the Central bank lets NGDP fall below trend. That probably true but how economically relevant that effect is, should probably be investigated. This ‘money illusion’ argument can also be made in the other direction. In a good year it has positive effects for workers, because you don’t have to get into a annual fight over wages adjusting to inflation anymore. This would be a positive for all wage earners. Unions might hate it because it takes away one of their major reasons for existing, and make unionization less important. On the other hand they would have more resources to getting real improvements. An alternative argument is that very long term stability of price is also useful for people. Sure mathematically we are able to calculate everything inflation adjusted but that not very practical. People today have completely lost all intuition about real price changes because the demand price changes are so much larger ie. “a candy-bar used to be 10 Cent’. So they know their was inflation but they don’t know if candy-bars have increased or decreased in real price. I’m happy with fighting for a 5% NGDPLT, we should not be to distracted arguing about these minor points. The way the economics profession is right now, talking about the positive virtue of deflation (of any kind) will probably get you kicked out. Hi Lars, it’s been a while. I’ve had a few long email exchanges with Scott related to this post. The ideal target would be a moving target based on a moving window of the trailing 10-year real GDP growth + 2% inflation. There is no ideal NGDP target because it depends on each country’s economic development phase. Due to the short sample size, aren’t you capturing a snapshot of the growth patterns of Developed Countries vs. Emerging Countries from 1990-present? The ECs have had higher volatility or growth rate during this time but likely due to their mode of production, which is more volatile in nature. Countries like US and Europe’s mode of production is services and demonstrate lower volatility. Why is that optimal? I see no reason for that to be true. We do have clear microeconomic resons that 0% is best (Prices relative and absolute are right). 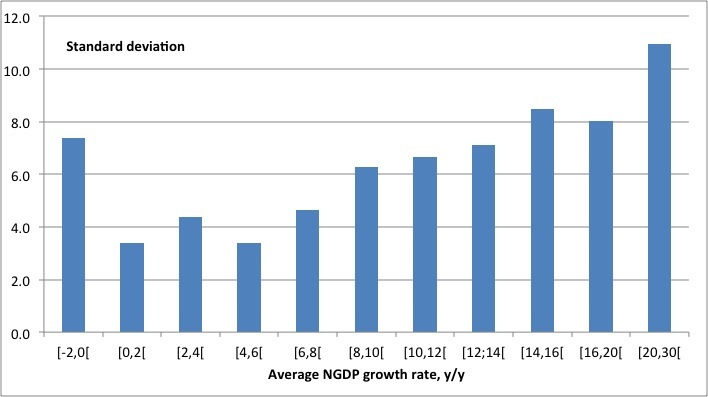 Why does going to RGDP growth + 2% help? I have never been able to understand this. Scott makes psychological arguments against it (the money illusion) but nothing I would expect to be bigger then the benefit of correct prices. Nickikt, the only claim I make is for the sample I have the volatility of NGDP growth is minimized for NGDP growth between 0% and 6% and that there is no major difference between 0% and 6% so you might as well target the one or the other. 0% is fine for me – if you start off in equilibrium.